Some of the acting is still awful and you realise why Jasper has one line between the first two films – Jackson Rathbone was clearly cast for his ability to smoulder and do that cute sort of cocky half smile rather than delivering actual believable dialogue. And Kristen Stewart’s rather obvious wig distracted me from what was going on half the time (the film was shot when she had a black mullet to play Joan Jett in The Runaways). But, it was altogether more enjoyable than the first two, with more action and character development. I actually felt something for Bella for the first time, ever, as she battles with the ever more likely possibility of never being able to see her mother again, nor growing up and having children. I wasn’t too sure about the decision to change the actress playing Victoria, but Bryce Dallas Howard gave a good performance as the vengeful redhead alongside the newly-cast bit of beefcake playing Riley. Indeed, I think that is a question most fans have asked since first reading the books. Bella Swan has as much charisma as a Big Brother contestant who gets voted off in the first week for being boring. There is just nothing much to her. Saying that, I still have a bit of a girl-crush on the impeccably sombre looking Kristen Stewart. Don’t ask, she’s just cool. 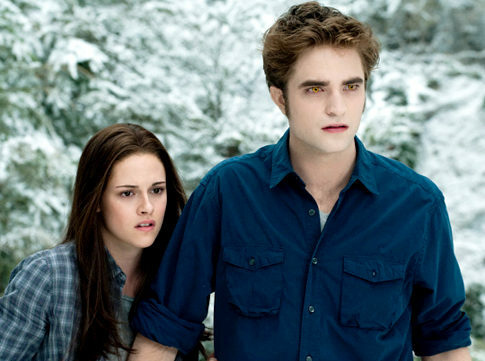 Let’s face it, a Twilight film never is going to win an Oscar or anything. It’s not about that, it’s about fawning over the pretty people in it and having fun. maybe twilight reflects the essence of being a teenager, and a romantic. i see adults reading this on the train. !